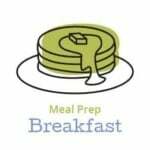 No flipping meal prep protein pancakes- learn how to make protein pancakes in a sheet pan for a big batch meal prep breakfast that you can stash in the fridge or freezer. Since moving into our new house this summer, we’ve adopted a new food tradition…pancakes on the weekend mornings! Now, this might not sound like a crazy tradition to you, and it really isn’t. But for so long, I’ve been pancake-challenged. Mostly pancake-batter-mixing-challenged and standing-over-a-hot-stove-flipping-challenged. Mostly, I just need a cup of coffee before I can function, but somehow in the new house, pancakes have been in high demand, and I have been more than happy to oblige. I have two complaints when it comes to pancakes: 1) standing over the stove and flipping, and 2) they don’t always leave you feeling satisfied. So today’s no flipping meal prep protein pancakes are my answer to these two complaints! This is my first ever attempt to make anything with protein powder. I have mostly unpleasant memories of protein powder from back when I was competitive cross-country skiing. I remember gross, fake-tasting stuff that didn’t dissolve properly and I had to pinch my nose to drink it. …and baked into these pancakes, you’d never guess it was there, if it wasn’t for the fact that these pancakes will actually fill you up! Now these no flipping meal prep protein pancakes took me several tries to get just right. 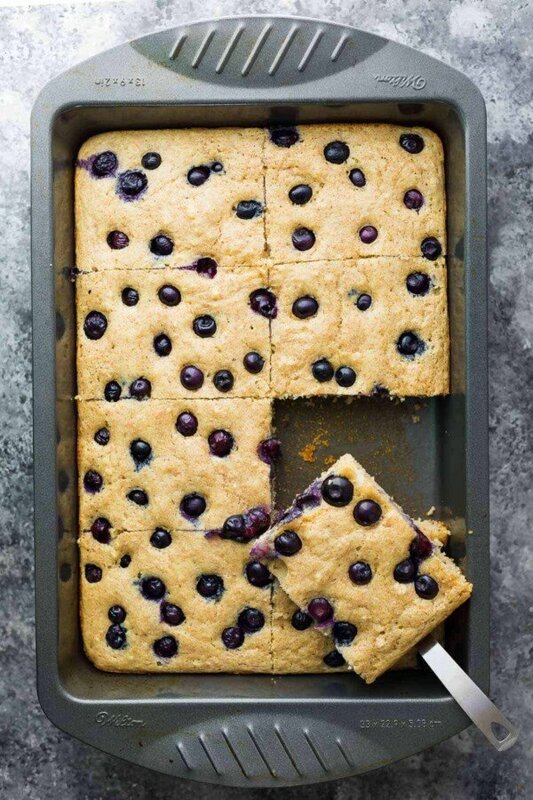 I tried to adapt my Extra Fluffy Blueberry Almond Pancakes, but the Greek yogurt left the resulting sheet pan pancake surprisingly gummy and dense. So in the end I had to play around with the recipe quite a bit, and ended up replacing the Greek yogurt with some coconut oil and some extra milk (you should be fine to use almond milk as well). Not to mention adding half whole wheat flour, and messing with the leavener ratios. But I did finally get the pancake I imagined. Hurray! 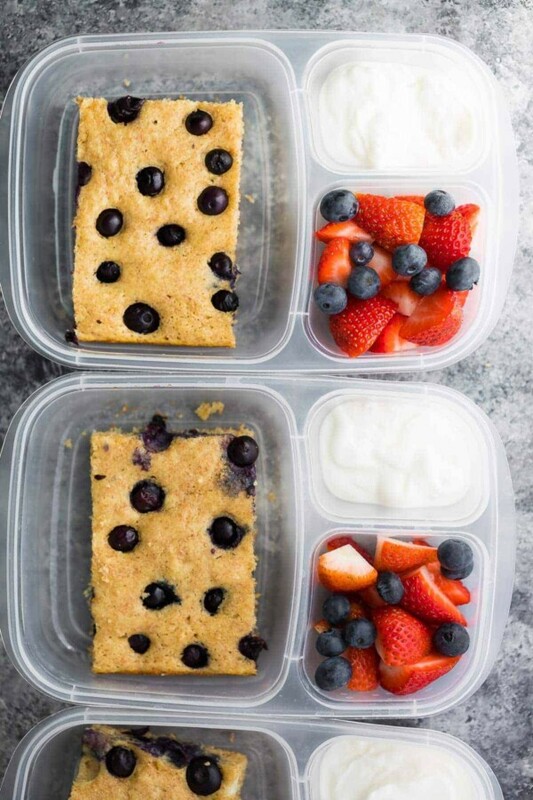 , along with some yogurt and berries, and freezing the other four portions. They were such a delicious breakfast to enjoy, and because of the protein powder, each pancake portion has 11 g of protein, which fills you up for so much longer than a regular pancake. By day four, the pancake starts to get a tiny bit dry. You could try wrapping in plastic, but I found dipping it in the yogurt and/or drizzling with a touch of syrup helped. Honestly I didn’t mind one bit and still enjoyed them. , and haven’t tested the pancake with a different brand, or without the protein powder. In a large bowl, stir together the flour, baking powder and protein powder. Add in the maple syrup, milk, eggs and butter, and mix until just combined. 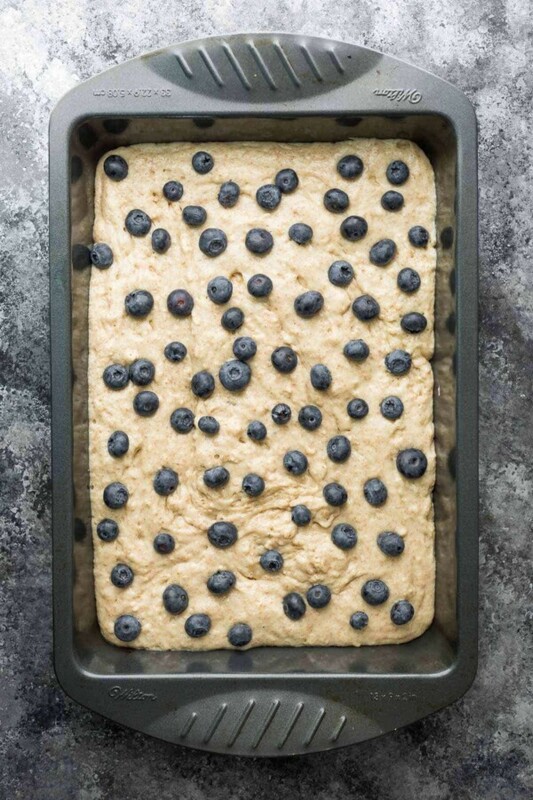 Spray a 9 x 13 inch baking pan with oil, and rub with a paper towel to ensure even coverage. 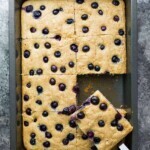 Pour the batter into the baking pan and sprinkle with blueberries. Bake for 15-18 minutes, until a toothpick comes out of the centre cleanly and pancake springs back to the touch. Allow to cool for 10-20 minutes, then slice into 8 portions. StorageStore in the fridge for 4 days in a sealed container. Store in the freezer, wrapped in plastic and stored in a larger freezer bag or container, for up to 3 months. Thaw completely before serving. To Serve:Enjoy cold or heated slightly. Serve with yogurt and fresh fruit, and/or maple syrup. 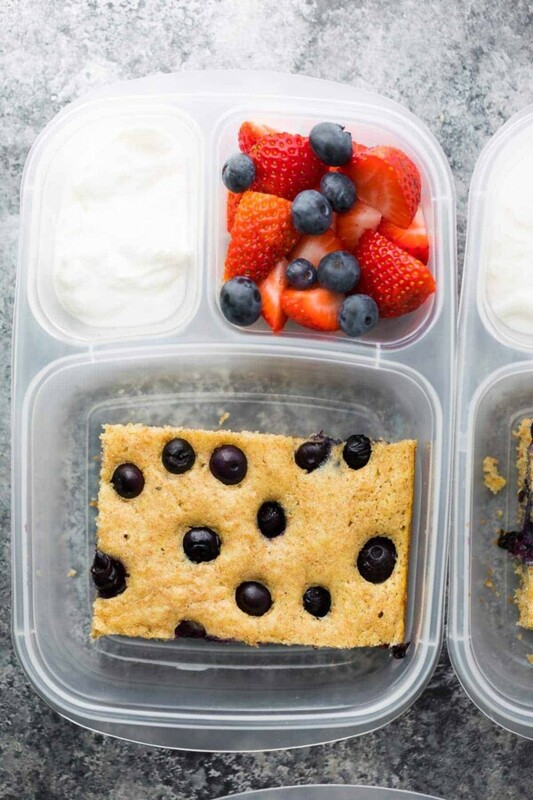 This recipe has become my go-to for a fast breakfast prep. This week I also mixed it 2 tbsp of green tea matcha powder and they turned out great!! My five-year-old is not a fan of blueberries in his pancakes (though he loves to add them to other people’s). Any other suggestions for add-ins? I personally love banana nut pancakes and I’m wondering if you might have any suggestions for modifying the recipe for those additions? Hi Bronwyn! I bet bananas would work but I can’t eat them myself so I haven’t tried. Shredded apples or other berries could also work! So far I have successfully added: bananas, raspberries, and strawberries, blackberries were a bit too tart for us. This spring I want to try strawberry rhubarb! Just wondering, can you leave these out on your counter instead of refrigerating? 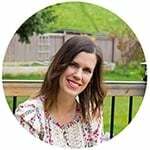 If you’re going to eat within a couple of days? These are fantastic and my kids loved them! I used Orgain organic protein powder from Costco and it was great. This will be a staple for busy mornings in my house! So happy to hear that, Kirsten! Thanks so much for taking the time to leave a review. In your recipe, where it says “1 scoop 5 tablespoons” of the protein powder- does that mean 1 scoop + an additional 5 tablespoons, or that we should add 1 scoop and that’s equivalent to 5 tablespoons? I’ve never used protein powder in my life so I want to make sure I understand. Thanks! Sorry about that! That’s an error. It should say 1 scoop, which worked out to a heaping half cup/ 43 g.
Made these today. Used Vega Vanilla Protein Powderl, they tasted great! I like that they are not too sweet. And the blueberries are perfect on top. We already ate one each. Very filling. Thank you Denise for another great recipe. Hi Tamaran, unfortunately I haven’t tried. I do believe someone used gluten-free flour with no issues but can’t say for sure. do you think using a lactose free 2% fat milk will make a difference on baking up? I don’t think that will be a problem; almond milk works as well! I’ve made these 3 times and they have all been cooked on the top/sides and raw in the middle 🙁 what am I doing wrong? I don’t have a 9×13 pan but the first time I used two metal bread loaf pans. I have also tried using a metal circular pan. As for the temperature in the oven I couldn’t say :/ I just moved in recently. Hi Adriana, I would think your pans are probably the issue; I’ve only tested it in the 9×13 pan indicated. You may have ended up with a thicker layer or pancake than I did and you may need to cook it for longer, although I can’t guarantee that it will turn out. hi there! could it be you’re not spreading it out correctly? maybe try making the sides thicker then the middle when you pour the batter! since the middle portion will take slightly longer to cook as compared to the sides! Can u use oat flour for them or coconut? I haven’t tried them with anything other than all purpose and whole wheat. We made this on Sunday afternoon & had for dinner on Monday – loved by all! Just popped it in the oven at 350 degrees for 15 minutes to heat it up right before dinner.